Ana is a girl who loves to read. 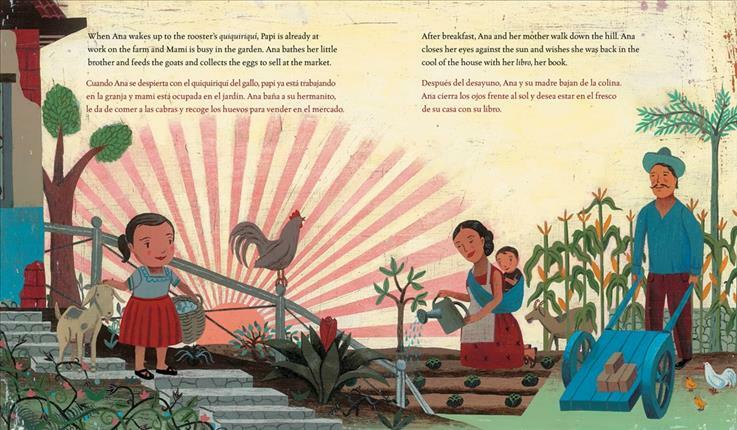 But she has only one book - a gift from her maestra who has moved away. 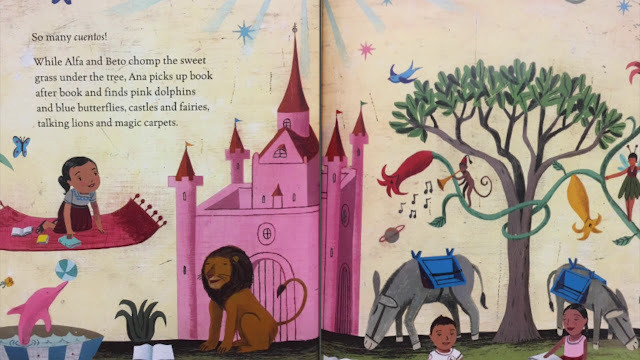 One morning, Ana wakes up to a strange sound and an even more surprising sight - a man on a burro, another trailing behind, and a sign that reads, "Biblioburro." 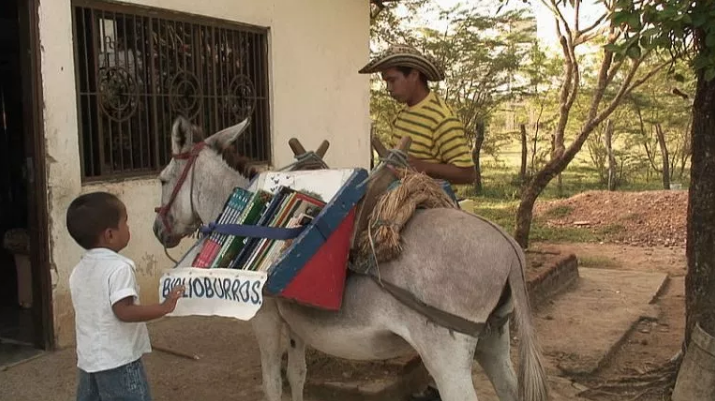 The man explains that he is a bibliotecario and, along with his burros Alpha and Beto, he brings his moving library to people who live too far to make it to libraries in "big cities and buildings." After reading to the children gathered around him and teaching a bit of reading, the bibliotecario lends them books and tells them he will return. Ana reads her book and waits and waits for the return of the Biblioburro. After a dream where Ana finds herself on the back of a butterfly, flying over her country, crossing mountains and rivers with, stories flying from her, "mouth and fingers like magic, falling into the hands of the children waiting below," she decides to write her own story. When the Biblioburro finally returns, Ana gives the bibliotecario the story she has written, and he adds it to his library. 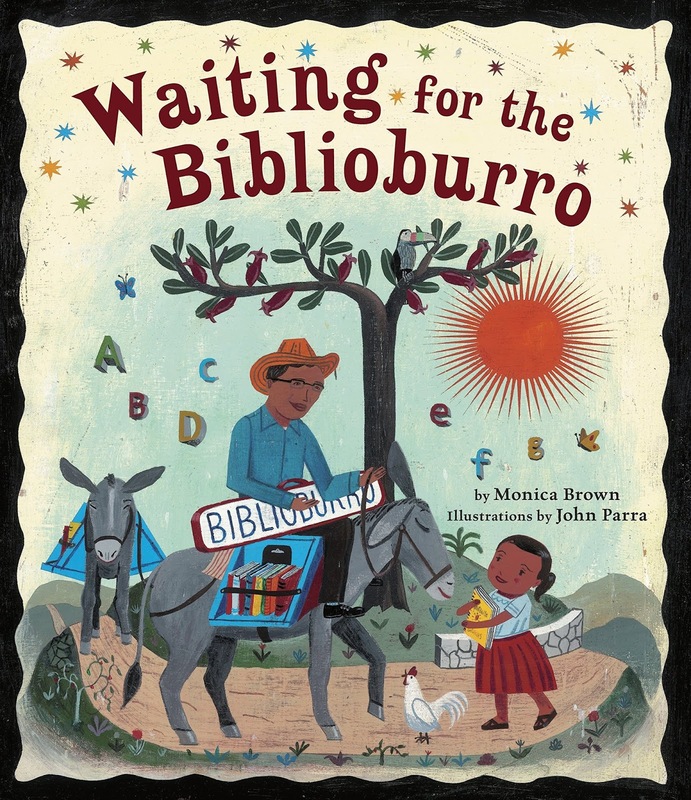 Luis Soriano Bohóriquez is the real life inspiration for Waiting for the Biblioburro, although he is only mentioned in the author's note. Brown's book was published in 2011, a year after Biblioburro: A True Story from Colombia, by Jeanette Winter. In October, 2008, Luis Soriano Bohóriquez was the subject of this New York Times article that gives depth and meaning to his work. Of this, Soriano Bohóriquez says, "This began as a necessity; then it became an obligation; and after that a custom. Now, it is an institution." Both Brown and Winters's books have been criticized for simplifying, even sanitizing, Soriano Bohóriquez and his life's work. While Brown's book does not mention him by name, or his country, Winters's book, a "true story," does not provide political context or accurate descriptions of the dangers Soriano Bohóriquez encoutners. As a librarian with a passion for literacy, I was excited to read Waiting for the Biblioburro and found it inspiring. However, after reading reviews at Social Justice Books: A Teaching for Change Project, I was disappointed that I did not have a richer, more accurate story of the life and work of Luis Soriano Bohóriquez to share with my students, as well as a description of life in a country where political violence and poverty make getting books - and even learning to read - an arduous, sometimes dangerous experience.